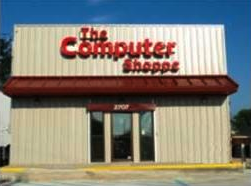 The Computer Shoppe in Metairie, LA, was one of the earliest Apple authorized computer dealerships, established in 1976, the same year that Apple Computer, Inc. was founded. It was also one of the longest continuously running Apple dealerships when it closed it's doors for the last time in early 2011 after 35 years of selling and supporting Apple products. The management and staff of The Computer Shoppe would like to thank all of our customers for your loyalty and patronage over the years. For your future Apple technical support needs we recommend that you contact Dave Hughes of Hughes MacWorks, LLC. Dave was the very first employee of The Computer Shoppe back in 1976. In the first few years of operation, Dave worked the sales floor, assembled computer kits for customers (prior to the Apple II, most home/hobby computers came as ready to assemble kits of electronic parts), and repaired computers. Eventually, as The Computer Shoppe staff expanded, Dave specialized in the education market and became our Systems Engineer, supporting our education focused sales staff. Dave left The Computer Shoppe in 1993, when Apple changed the terms of their education sales and marketing program and we were no longer involved in Apple Education sales. After seven years working as a Systems Engineer for Apple Education Sales Agent companies, and four years working directly for the Education Sales division of Apple, Inc. as a Systems Engineer and a Technical Services Consultant, Dave went into business for himself and established Hughes MacWorks, LLC. Hughes MacWorks is a full-service computer consultancy, specializing in support of Apple products. HMW provides pre-purchase consultation, installation, training, troubleshooting, system maintenance and upgrade services. Dave holds Apple's highest software certification, Apple Certified System Administrator, so he is well qualified to help ensure that you get the most from your investment in Apple hardware and software. Dave is assisted by his brother, Scot Hughes, who also has many years of experience supporting Apple products. Visit the Hughes MacWorks website for details on the services they offer.